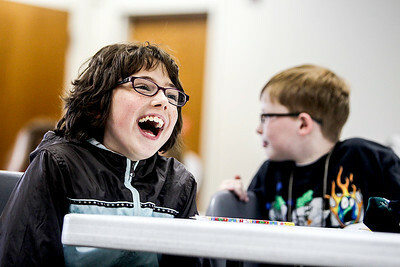 Sarah Nader- snader@shawmedia.com Bobby Reckamp, 8, of Crystal Lake creates a three part comic at Cary Public Library during a comic book workshop Tuesday, April 29, 2014. Sarah Nader- snader@shawmedia.com Jenny Lea, 9, of Crystal Lake reacts while DC Comics employee and Northwestern University graduate Josh Elder spoke about how to create your own comic at Cary Public Library during a comic book workshop Tuesday, April 29, 2014. Elder is the founder of the educational non-profit, Reading with Pictures, which promotes the use of comics in schools, including their use as part of the Common Core curriculum. Sarah Nader- snader@shawmedia.com DC Comics employee and Northwestern University graduate Josh Elder spoke to children about the history of comics and how to create their own comic at Cary Public Library during his comic book workshop Tuesday, April 29, 2014. Elder is the founder of the educational non-profit, Reading with Pictures, which promotes the use of comics in schools, including their use as part of the Common Core curriculum. Jenny Lea, 9, of Crystal Lake reacts while DC Comics employee and Northwestern University graduate Josh Elder spoke about how to create your own comic at Cary Public Library during a comic book workshop Tuesday, April 29, 2014. 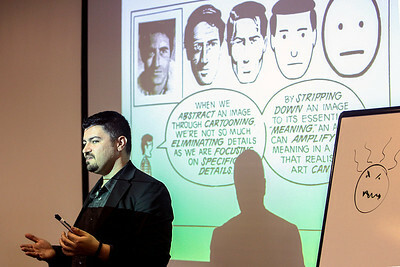 Elder is the founder of the educational non-profit, Reading with Pictures, which promotes the use of comics in schools, including their use as part of the Common Core curriculum.